by marc / Thursday, 06 September 2018 / Blog Category: Everything Vegas. Topgolf is more than just a golf driving range. Their locations around the country are beloved for fun games, great food, and easy access to adult beverages. Topgolf Las Vegas opened at MGM Grand as the flagship location for the company in 2016. As you might imagine, this location is unlike any other Topgolf around the country. For starters, the flagship outlet is four levels and 105,000 square feet large. It has 108 climate-controlled hitting bays for golf, two pools, poolside cabanas, a concert venue, VIP suites, five bars, a living room-type area called The Yard for dining, drinking and playing games, a sportsbook window, 300 televisions, three massive viewing screens in the yard, and three more at the end of the driving range and full food and signature cocktail menus. WHEW! That’s a long description. The flagship location for Topgolf is an amazing complex that appeals to both golfers and people that just want to hang out. My last visit was with some friends who wanted to play the games. A few of us just watched them play and drank wine. It was a classy wine night out and everyone had a great time! Topgolf has expanded its footprint in Las Vegas. They aren’t building another grand structure like you’ll find at MGM Grand. The new outlet will be what they call a Topgolf Swing Suite. The suite is a streamlined way to play Topgolf. M Resort now has a new two-bay Topgolf Swing Suite. The new space allows guests to play Topgolf games in a spacious, temperature-controlled room with comfortable lounge seating. 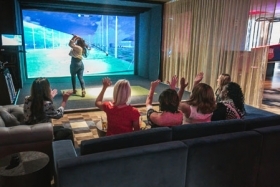 The Swing Suite is more than just a virtual driving range for golfers and the games are more than just banging some golf balls into a screen. Guests can play various golf and multi-sport games including the TopContender, modeled after Topgolf’s signature game, which tracks shot accuracy while awarding players points for hitting targets. Golf fans can test their skills by playing some of the world’s most famous golf courses such as St. Andrews, Gleneagles, Torrey Pines, Pebble Beach and more. The Swing Suite also has the option for players to take the pitchers mound and pitch against a team of zombies. Players must be 18 years or older unless accompanied by an adult. All equipment will be provided. The Swing Suite at M Resort does not allow guests to use their personal golf equipment. Topgolf Swing Suite reservations can be made through OpenTable. Reservations are recommended but not required. Walk up guests are welcome but there could be a wait. I’ve been told that some people have had to wait for four hours to play at Topgolf on the weekend at the Flagship location at MGM Grand.